Having just completed a sell-out national tour of Fences, Tanya Moodie is donning another transatlantic accent in her role as Esther in Lynn Nottage’s Intimate Apparel. Having played a vast range of diverse role throughout her career the RADA trained actress is hugely committed to her craft. Often referring to her character Esther in the first person, Moodie explains the fascinating background to the production and her constant endeavour to open the hearts of her audience. 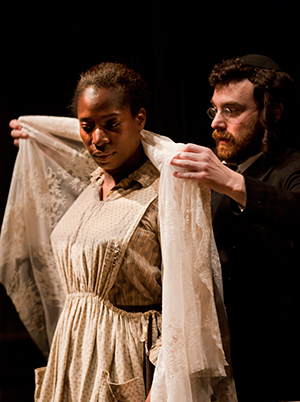 What is the backstory to the writing of Intimate Apparel? Lynn Nottage was cleaning out her grandmother’s house and found an old picture of her great grandmother. It was then that she found out she had a relative who had married a Barbadian immigrant in New York. There was no family history there so she wanted to create a story to try to make sense of her heritage. So she has used creative licence on some facts and has created a story about a very grand seamstress in New York in 1905. Esther is 35 and as yet unmarried and childless and desperate to find love and belonging. She enters into this writing relationship, corresponding with a man from Barbados. Who is helping to build the Panama Canal. After so many Jamaicans died in the building of the canal the Jamaican islands refused to get involved any more. So loads of Barbadians came on board and helped to build it. They also died in their droves through accidents and disease; it was a terrible job. So my character Esther corresponds with this man and it goes from there. I don’t want to say much more because I think it’s nice for an audience to come in and see it unfurl like a beautiful piece of fabric. I feel that when people come and see it there’s a palpable sense of ‘What happened next?’ There’s a really moreish rhythm to it and you become invested in these characters. So their communication is through letters, sort of like a historical Instagram? Yes, very old fashioned. I used to write letters. (Laughs.) In fact with my first and second husband, both of our courtships were through letter writing. I imagine to my six-year-old daughter that would be a complete anathema. People don’t really write letters any more, but everybody likes to receive them. How would you describe your character Esther? Esther is incredibly gifted. She has this natural ability to create the most beautiful intimate apparel. Not only is she an unusually skilled seamstress but she says at one point that “Folk will pay good money for your discretion.” So she’s very savvy. I’m fiercely loyal and hard working. A cautious dreamer. You mention she’s a dreamer. Is her ambition to open a black women’s beauty salon one of her dreams? Yes. At the time there was an actual woman, Madam C.J. Walker who became America’s first black millionairess. She’s kind of like Anita Roddick; she used to go door to door with products and eventually set up many salons and became a real trailblazer. I don’t know if that actual woman hadn’t existed in reality if Esther would have this dream in the fictional world. Lynn was highlighting the fact that the American dream was ripe. This was the time of the industrial revolution where people were becoming insanely wealthy and yet there were many people starving and on the breadline. It was actually possible for a poor black woman to become a millionairess. Slavery had been abolished, people were hungry for consumerism, huge skyscrapers were being built and if you had a good idea and could follow it through you could be successful. So Esther’s dream is a real and possible dream. My ambitions for Esther were real. As a black woman in 1905 New York, do you think Esther’s colour affected the way she was treated by her customers? I made it absolutely clear in rehearsal that I was playing a professional seamstress who had amassed a small fortune on my own and wasn’t a slave. So anything that had to be picked up or cleaned, I said “Absolutely not. I’m not a servant, I’m a business woman.” So because I am so skilled at what I do anyone who meets me has an incredible amount of respect for me. So Esther doesn’t adopt the typical post-slavery stance? I think I am humble as Esther but not because I lack self-esteem in terms of myself as a professional. But I lack self-worth in terms of my ability to find somebody to love. My dad was a slave and he was made a free man during my lifetime and my mother died when I was 17 of influenza. So I was on my own and I left North Carolina and made my way north and I had to crawl from the bottom. So I have no pretences; I’m not cocky. I’m 35 and I want to be married and have a child. It says in the play that there are no professional black men. There are labourers, who are undereducated and they still get rejected in favour of white men even if they’re old and can’t lift heavy things. So what choice is there for me to marry? I was kind of thinking if I could have met Esther myself I would have said “Darling, don’t open a beauty salon; open a bespoke tailoring business.” But she makes beautiful things because she doesn’t feel beautiful. So I compensate with this wild desire to make others beautiful in a beauty parlour. I feel that Esther misses a trick with her incredible skill. But maybe that’s the next chapter of the fictional story. I feel that when people come and see it there’s a palpable sense of ‘What happened next?’ There’s a really moreish rhythm to it and you become invested in these characters. This is the second play set in 20th century America that you’ve done in the last year. 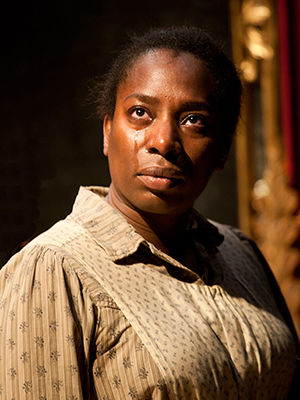 How was your experience of playing Rose in Fences? Oh, Rose opened me up so much; my heart and my life. Playing her also coincided with a particular era of my own life, I was opening the doors to a new era of my awareness and existence and it happened to coincide with this other woman’s shift. You know they say life begins at 40? (Laughs.) It’s not a bowl of cherries. In order to be able to create art and be able to open people’s hearts we’ve got to be able to dig deep in the places of our own lives and that can be uncomfortable. To me it’s my responsibility to do that. That’s what people have come to participate in. They’ve come to potentially change something in their own lives and if I don’t commit to that process every single show then why are we there? Read this interview and if it ignites something in your heart you won’t regret the effort you would have spent to go and see Intimate Apparel. I have yet to meet one person who had regretted it. As a Buddhist do you feel your faith comes into your acting in any way? Although your work isn’t therapy, you are a patron of Roundabout Drama Therapy. What does that involve? Yes I am. Very happy to big up Roundabout Dramatherapy. (Laughs.) Though I’d heard of drama therapy I wasn’t quite sure what it involved, so when they asked me to become a patron I said “I’d love to, however I’d need to come in and participate.” So I went into their residence of a school on the outskirts of London and I went and participated in a session with two kids. They’d been doing drama therapy throughout their primary school time and were in their final year and they had transformed dramatically. They told me their stories and I was just flabbergasted at these two children in front of me who were so full of love and potential and hope. I really understand first-hand how it works. Like any therapeutic process it’s gradual; it’s not like they hand you a kid with a trauma and after a few drama games they’re better. It’s something which I am so proud of being involved in. Why should people come and see Intimate Apparel? Why should people come and see Intimate Apparel? Well, they don’t have to. I’d rather say to people, read the review, read this interview and if it ignites something in your heart you won’t regret the effort you would have spent to go and see it. I have yet to meet one person who had regretted it.